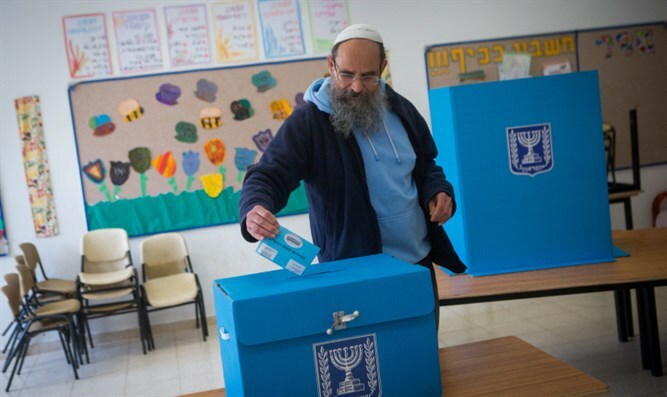 MainAll NewsInside IsraelSettlers 'over-voting' - and voting for Arab parties? Did Israeli towns in Judea and Samaria 'over-vote'? Also, why did some Israeli settlements seem to back anti-Zionist Arab parties? Some Israeli towns in Judea and Samaria have been accused of ‘over-voting’ – with higher numbers of ballots cast than registered voters, leading to calls for the Central Elections Committee to investigate possible voter fraud in the reliably right-wing settlement population. 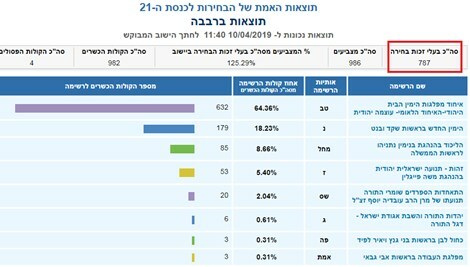 Mainstream Israeli media outlets, including Channel 12, carried the claim, showing a number of towns which, according to the Central Elections Committee website, had more votes than registered voters. According to a report by Channel 12, committee officials are investigating the reports, while suggesting that the discrepancies may be due to human error. The report showed that in the Samaria town of Bruchin, for instance, 385 votes were cast, even though only 230 registered voters appear on the committee’s listing for the town, giving Bruchin a voter turnout rate of 167%. In another Samaria town, Peduel, voter turnout was 113%, with 894 votes by 789 registered voters. The town of Revava showed 986 votes, while having just 787 registered voters. But an examination of the election committee’s current and 2015 voting sites suggest a likely cause of the discrepancy – a simple failure to update voter registration numbers. In 2015, Bruchin had 230 registered voters listed on the election committee website. 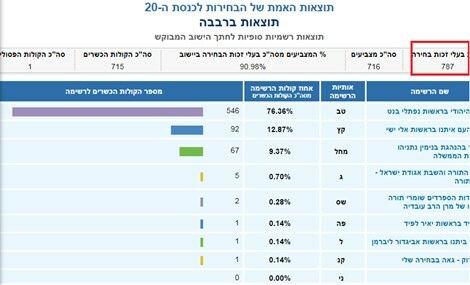 Of that 230, 198 people, or 86%, voted – a typical voter turnout rate for an Israeli town in Judea and Samaria. This year, Bruchin was listed as having still just 230 registered voters, despite growing significantly over the past four years and adding hundreds of new residents. Peduel, also, grew significantly in recent years, growing from 1501 in 2014 to 2070 in January 2019. Yet the number of registered voters listed for 2015 and 2019 in Peduel remained identical – 789. In 2015, 686 people voted in Peduel, or 87% of all registered voters. Given the town’s growth rate, the current vote total of 894 is roughly consistent with a turnout level in the mid to high 80s – and consistent with the town’s voter turnout in 2015. In Revava, as well, the voter registration numbers seem to be a hold-over from 2015, with exactly the same number listed in both 2015 and 2019 – 787. This despite the fact that between 2014 and 2019, Revava’s population grew by over 50%. The problem was not confined to Jewish towns in Judea and Samaria. Inside pre-1967 Israel, the Bedouin Arab town of Al-Sayyid was listed as having 369 registered voters, but 544 votes this year, representing a turnout rate of 147%. But the number of registered voters was unchanged from 2015, when the number was listed as 369. Other apparent irregularities were also reported in Israeli towns in Judea and Samaria, such as surprisingly large support for the two anti-Zionist Arab tickets. In the town of Itamar, in Samaria, for example, the Hadash-Ta’al list came in second with 11.58% - surprising for a town with no Arab population, and which is almost entirely national-religious. The Zehut faction, by comparison, received no votes, according to the Central Elections Committee website. 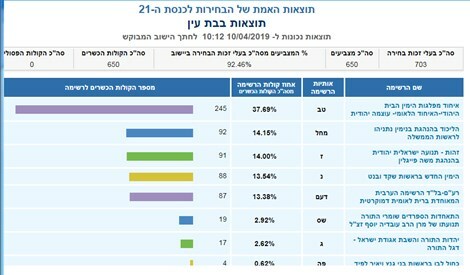 A spokesperson for the town of Itamar, however, said that the official in charge of Itamar’s polling center had disputed the results, saying it was in fact Zehut which came in second with 11.58%. Other Israeli towns in Judea and Samaria had similar issues. In Bat Ayin, in Judea, the anti-Zionist United Arab List – Balad ticket was shown to have won 13.38% of the vote, despite the town having no Arab population.